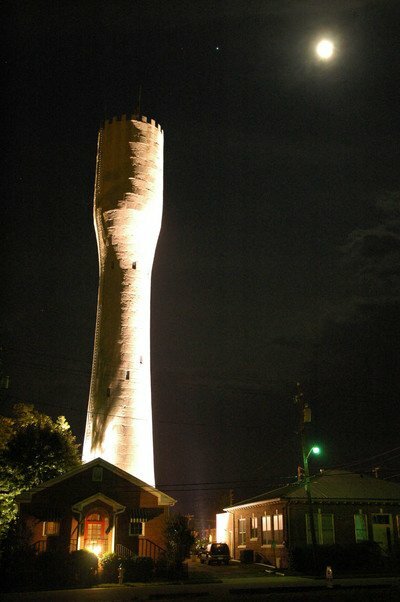 This unique, castle-like structure was built in 1908-09 as a water tower for the City of Belton. Rising 155 feet into the air, it has long been used by pilots to pinpoint their location along the eastern seaboard. Interestingly, the tower is not a true standpipe in that standpipes store water throughout their lengths, not just in tanks at top. Another odd fact is that, unlike a lighthouse, the “standpipe” has no stairs inside it. 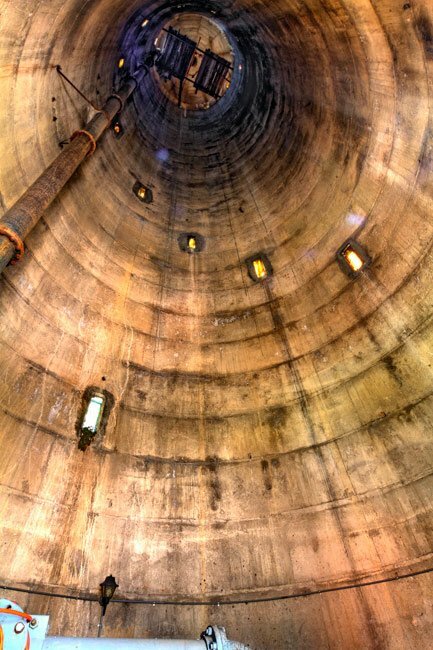 A ladder reaches along the exterior, and water flows through a 10-inch pipe in the tower’s center. The small windows in the wall, as seen in the interior photo below, were included to allow ventilation and visibility during construction. The tower’s unusual shape helps to evenly distribute its weight. It is constructed from concrete which was poured in stages, giving the tower the illusion of being built of stone. 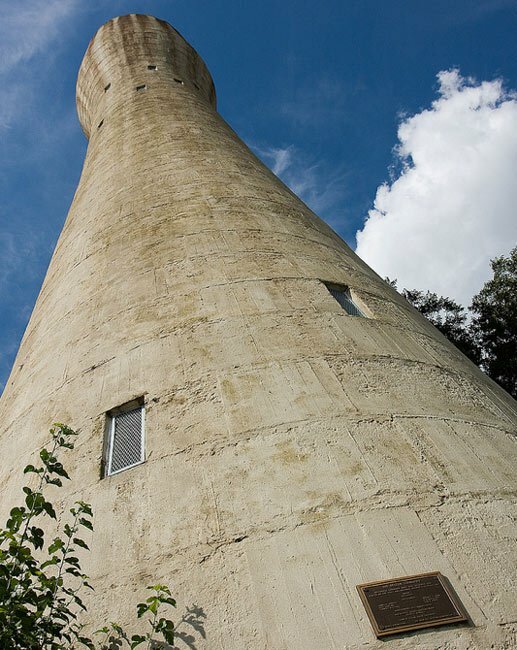 Still used to store the city’s water supply, the capacity of the water tank within the tower is 165,000 gallons. It is located on McGee Way near its intersection with Campbell Street, one block from Belton’s business district. 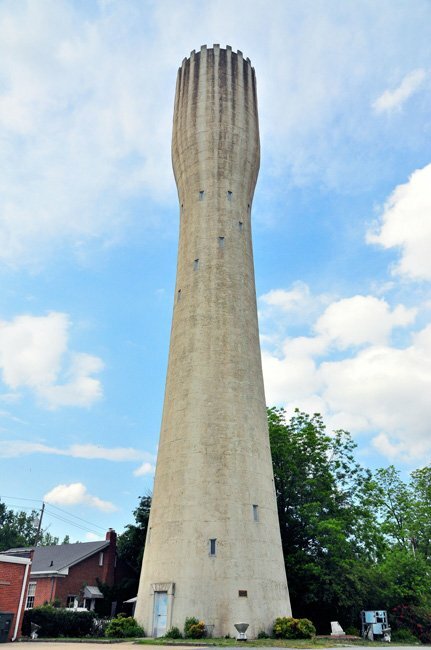 In 1987, the first annual Belton Standpipe Festival was held to raise money for renovations needed to preserve Belton’s most distinguished landmark. The image of the standpipe is included in the design of the town seal and is found on the city’s letterhead. 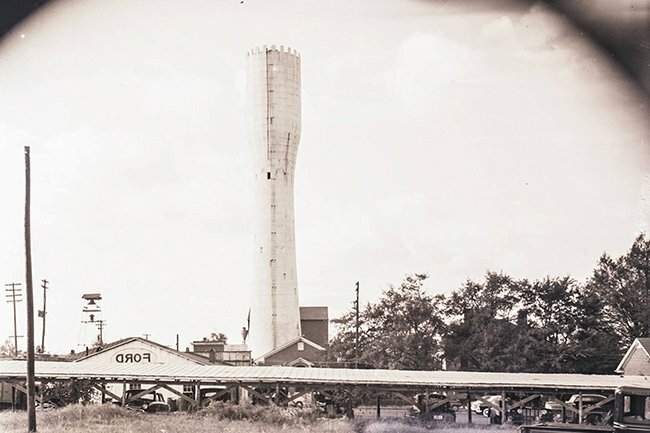 Of note, there is a similar standpipe-style water tower in Walterboro, as well as one in Allendale. These are the only three such towers in South Carolina. I grew up in Belton, and this photo reminded me of a dramatic incident from my childhood. The small building in the foreground is the public library, where as a young nerd I spent much of my time. One winter ice formed on the top of the standpipe, which thawed and released the ice. I was reading at the library when, with a loud crashing sound, a large block of ice fell through the roof, hitting the nice librarian. We children were ushered out when help arrived, after seeing her bleeding from the head. I vaguely remember that she survived. I wonder how accurate my memory of 75 years ago really is? Does anyone know anything about this?